Music-streaming service Spotify recently confirmed a whopping $250 million expansion round of funding. But with a lot of public heat from high profile musicians questioning whether the Spotify platform is a boom or bust for business, today the company is launching a new artist-friendly site, and putting out updated news on the rise in rightsholder payouts, which it hopes will demonstrate that it’s not just growing for its own gain. 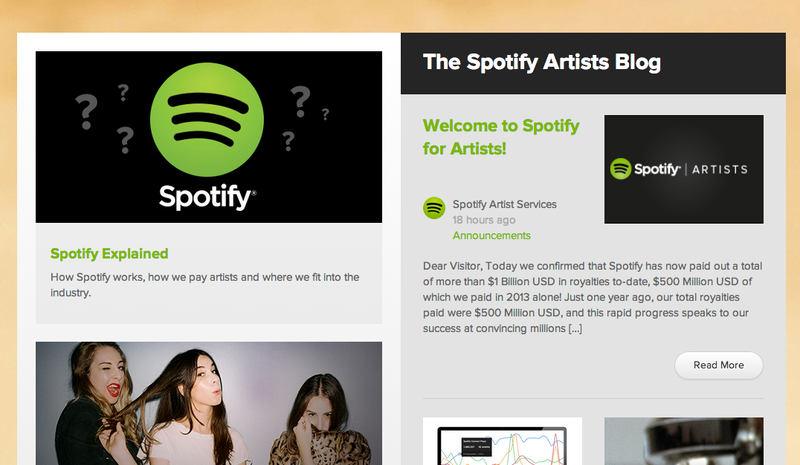 Spotify Artists Website is a B2B play that will be an interface between the streaming music platform and the musicians/managers that put their content on it, giving the latter a lot more transparency on how payouts work and other news about the site. On top of that, as befitting a platform, Spotify has teamed up with Next Big Sound to create a dashboard for artists and managers to have real-time access to data about how their music is performing on the site and other details. Spotify is also confirming that so far in 2013, it has paid out $500 million in royalties to music rightsholders — that is, labels and artists and all others who get a cut of music whenever it is streamed on Spotify’s service. Spotify has been built in part on the back of social media and consumers effectively becoming the marketeers for the services that they use, that has been a blessing and a curse. The moves today underscore the public (and perhaps also private) pressure that Spotify has been under from some artists who accuse the company of being greedy and not actually all that financially beneficial for those whose music is streamed on it. While Spotify has worked hard to win over some of the most influential artists out there (one big win was getting Metallica on board last year), it has also seen some of these artists pull their music from the service as well. Today’s move is, in a way, Spotify’s attempt to turn that kind of public dialogue in its favor. Artists have been able to accuse Spotify of being greedy and difficult to work with because there hasn’t really been a decent enough way for them to assess how well they are performing on the platform. But now, by a creating an analytics dashboard (which will be free, for now at least), Spotify is giving them a lot more information about how their music is performing. No, this will not automatically mean more payouts. But it is a kind of quid pro quo that adds value to having that music on Spotify anyway: artists and their labels will now be able to see more clearly how certain tracks are performing, and can use that data to inform whatever marketing (or even music creation?) they decide to do next. Although Spotify has been knocked a bit in the public eye, it’s still the platform to beat against others like Deezer, which has yet to launch in the U.S. but is expected to soon, and Rdio, which has apparently “beautiful” APIs for its partners (so a developer source tells me) but hasn’t seen the critical mass of user adoption that Spotify has and has undertaken some layoffs to right-size itself. While the news in November was about Spotify securing financing for the future (it is still loss-making as a service), today’s news is about Spotify showing that it is minding those on whom it is reliant for its plaform to have any meaning for consumers. As the third part of this hat-trick, you can probably expect that this will also lead, soon, to more product launches as well, both on mobile (it’s fastest-growing platform) and on the web — where we have heard that the company is likely to be releasing a web-version API for developers and other third parties soon.